Hooray, Hooray, Time to Start Poem-A-Day! Well tomorrow anyhow. April is National Poetry Month and, for the poets among us, a few years back WRITER’S DIGEST Poetry Editor Robert Brewer offered a challenge: to write a poem, from a prompt he would offer on his blog, every day during April. This proved popular enough that now he does it in November too and, for the months that lie in between, he offers a weekly prompt every Wednesday. to give cats something to do. but now they have mice. What is the connection between science and horror? Characters sliced and diced — bad deaths and worse ones? What does the cave cat Wednesday do when no one’s looking? These are some of the questions answered on dark fantasy author Tim Marquitz’s blog, The Dark Fantastic, in which I appear as today’s interviewee. Also there’s more information on upcoming poetry book VAMPS (A RETROSPECTIVE), although it now seems it will coming out a bit later than had been scheduled when Tim and I did the interview some weeks back. Such are the changes and delays in publishing. Also some hints about the stories that can be found right now in my collections, STRANGE MISTRESSES and DARKER LOVES — just click on the book covers to the right. All this and more, at the click of a mouse (ah now, Wednesday), plus space for comments both below and on Tim’s blog. Outside here it’s a beautiful spring day and I know I’m going out for a walk in a minute, but when you’ve a moment between other activities, do stop by and visit! So began the call for submissions. 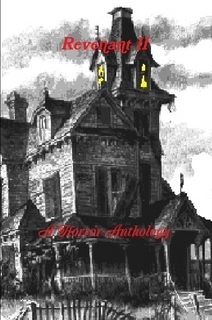 Then after some time had passed, editor Armand Rosamilia decided he had sufficient stories he just had to publish to warrant splitting this upcoming e-book into two volumes, REVENANT and REVENANT II. My part of this falls in about the middle of REVENANT II, a story first seen in Catalyst Books’ SONGS FROM DEAD SINGERS (2002) of a “house in Vicksburg [that] dated back to before the Civil War and, as its owner found out, held much more than just memories,” of the siege of Vicksburg and what came just after with ramifications that lead to the present, “The Cherry Tree.” And then, yesterday, word arrived via Google that REVENANT with seven stories, and REVENANT II with six more including mine, are finally out from Rymfire eBooks. Both volumes should be carried by Smashwords and Amazon while Lulu offers both e-book and print versions. So as nights grow warmer and summer storms crackle just past the horizon, and with the wind’s freshening are gathering nearer, here may be some excellent after-hours reading to keep you awake. Then when sleep finally comes, to haunt your dreams. I just got results of the STRANGE HORIZONS reader poll (cf. March 6 post) and, as predicted, my “Sestina for Death” didn’t win. However two friends, Marge Simon and Bruce Boston, copped first and third for poetry respectively. And that’s kind of neat too! Resident cave cat Wednesday greeted me this morning with her usual request for breakfast. She’s fed twice a day but does most of her serious eating at night. However, this time she’d scarcely touched her supper. This isn’t unusual. Most likely she’d caught a mouse sometime last night. She eats her kills, as a cave cat should, and it’s an older house, subject to mice during Mouse Season, generally spring and fall at this latitude. If she’d made any noise I’d slept right through it, just as the usual noises of plumbing, wind against windows, etc., aren’t anything to wake anyone up. In fact, one of the fun things in the morning is to find the occasional cat toy far away from where it had been the previous night, and toss it back into her usual play area. Last night, however, I’d watched the movie PARANORMAL ACTIVITY. This is one of those BLAIR WITCH-style pseudo-documentaries like CLOVERFIELD or [REC], this time with a couple who set up a camera to capture evidence of Mysterious Happenings in their home at night. Bad idea! It’s not a bad movie (though not among the best of its kind, in my opinion), it has creepy moments, but it’s occurred to me how much of what happens in the movie — sounds of things crashing in other rooms, the bedroom door opening and closing seemingly by itself — even the strange. moving lump that gets under the bedclothes — could be explained if they’d had a cat. In a wonderful feat of missed timing (speaking of awards) I just realized voting for STRANGE HORIZONS’ reader poll for, among other things, best poem posted last year is ending even as I write this. Today’s lagniappe, from the August 30, 2010 issue, is unlikely to win in any event though; STRANGE HORIZONS is one of the top internet magazines and the competition is extremely tough. Let’s Hear It for the Octopus! So what can one say? For audio fans, my story “In the Octopus’s Garden” (cf. Jan. 12) is now up on THE DRABBLECAST — to get there click here, then scroll to “Drabblecast 199.” Originally published in 69 FLAVORS OF PARANOIA for March-April 1999 as well as electronically in EOTU EZINE, February 2001, “In the Octopus’s Garden” is currently available in print form in THE BOOK OF TENTACLES (Sam’s Dot Publishing, 2010). RAPUNZEL’S DAUGHTERS, including my story “The Glass Shoe,” has now been officially announced with a projected publication date of July 2011. To quote from the ad copy, “What dark arts will Little Miss Muffet employ to exact her revenge on the spider? Can a guide help the Big, Bad Wolf succeed in eating Little Red Riding Hood without getting caught? Is Prince Charming Gay? And will the Beast get tired of ravishing Beauty and instead turn his attention to Lady Gaga?” All these mysteries and more, including (ahem) my own tale, noted below in Jan. 5’s post, of Whatever became of Cinderella’s famous footwear? are herewith exposed in 31 stories by 30 authors answering the theme of “What happens after the ‘happily ever after'” in all those fairy tales, nursery rhymes, and legends we remember from childhood. 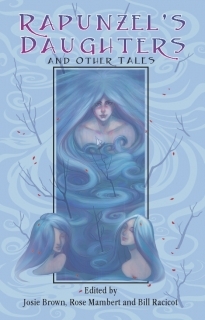 Princesses, frogs, talking wolves, wicked witches … available this summer from Pink Narcissus Press. On a less sanguine note, after a long, suspense-filled wait — one of the judges was even snowed in and unreachable for a final vote count — the finalists in the Short Mystery Fiction Society‘s Derringer competition were finally announced late Tuesday and my story “Ah, Liberté” (see posting for Feb. 1) was not among them. The judges selected five stories in each of four divisions which will now be voted on by SMFS members. However, “Ah, Liberté,” published late last year in the anthology THE WRONG SIDE OF THE LAW, was one of only 15 to be recommended in its category and, if I may say so, that’s not too bad.